I am an artist that loves to create images of superheroes, cartoon characters and I'm always experimenting with different ideas and techniques. 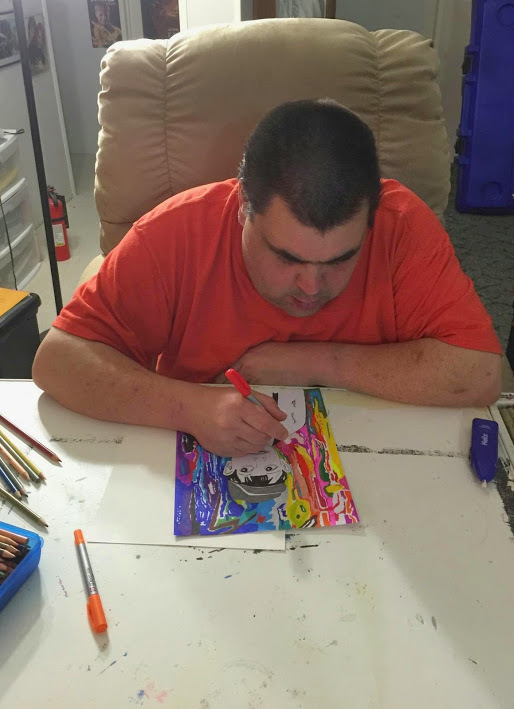 My main means of creation are acrylic paints, markers and colored pencils. It's been almost three years ago now that I was reacquainted with the fun and relaxation of drawing, painting and illustration. I had enjoyed art as a teen and into my early twenties but had been distracted by many factors as I moved into adulthood. Since I returned to art I have been very blessed to receive abundant encouragement from my wife, good friends and mentors. Over the past several years I have been trying to find something that fulfills me creatively. This desire has manifested itself in wanting to be a "flipper" of toys and collectibles in different variations buying low at yard sales and attempting to sell high -- needless to say these attempts failed before it even started and all it got me was wasted space. I would build model kits, customize action figures and build dioramas on this desk. Why didn't I remember I was an artist? Looking back I wish I had come back to art sooner. This is my desk. 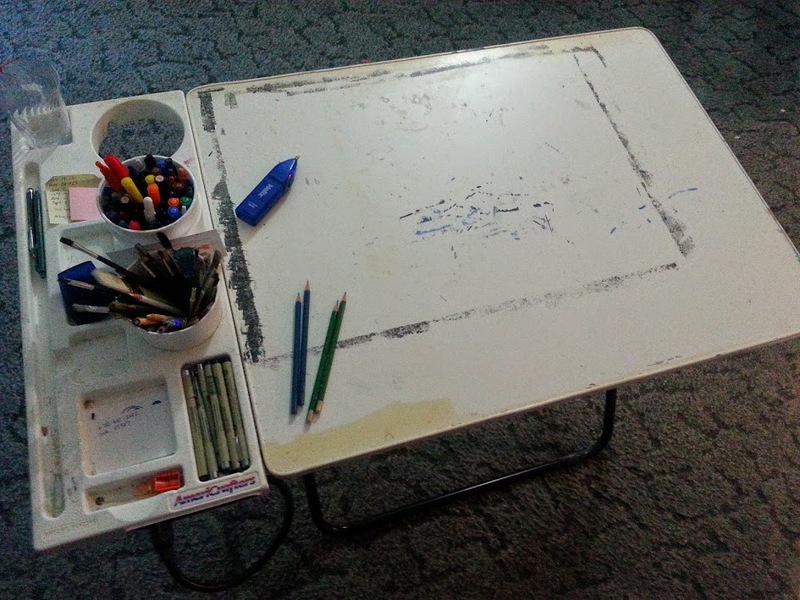 This arts and craft desk was given to me almost twenty years ago and has been with me through every "phase" of creative ADD. It has even served me as a table used to set up at flea markets when I was going to be a big time toy seller. I'm ashamed to say that it has even seen down time folded up and tucked away when there was periods of no creativity at all. This table was put back in service after I was encouraged by one of my mentors to delve deeper into my art and create a comfortable and usable work space. This desk is old, blemished and worn, but there's a lot of work left for it and I'm sure it won't let me down as I continue to create.